Frome turned out to be a very enjoyable round for the four of us who braved the rain. After moaning at the wet drips that cried off (you know who you are – there maybe fines!) we of course became wet drips ourselves as it lashed down. But rather strangely despite the golf being difficult everyone agreed that it was very sociable and Frome was immaculate despite imminent closure – such a shame. Julian tore us apart with a splendid 32 and Robin and Dave won the NP’s. To mix my metaphors or something like that, as it’s the Battle of Britain 75th anniversary, I will use the famous line from Brian Hanrahan in the Falklands , ‘we counted them all out and we counted them all back again’. Unlike Brian I can mention that there were four groups of three that left from the clubhouse that day but as the sun set over Shepton Mallett and we took another beer in the bar, there was some concern that the last group were not going to make it. Thank goodness JC’s trolley was spotted over the right hand bunker and to our relief John was still in control of it following behind. A tired JB and JM were soon to follow. Bar a few bramble scratches and midge bites the three J’s had made it. Not only had they returned but clutching the nearest the pin papers it was evident that Julian had won at the 7th, no one had actually landed on the green on the 17th , and Alex, for the first time had actually stayed on the fairway to win longest drive. As for the main prizes; third overall was Joe with 32 points, second was Russell with 32 on count back and won the Umbrella, but first with an exceptional 38 was Kier. Kier was also winner of the Best Average score of the season with an average of 34.25. It is great to see how much someone can keep improving and this was just deserts for excellent play. There was a new award this year” the Woodpecker award” which went to Rupert for hitting 11 trees, two of which were with the same shot. Rupert put it down to being over-golfed, having played twice this year. We retired for a tasty burger at the pub. Despite rain and swirling mist that was more appropriate for a Scottish moorland in autumn than SW England in July, 9 of us tee-ed off at Wells, Skin’s home course. Skin, Pete and Richard in the 1st group, Nick, Hugh B and Keir in the 2nd, and Julian, Ian and me in the tail gunner position. Highlights of the day were Richard’s 40 foot put, and Ian improbably finding his ball after driving off on the tricky 12th straight into deep woodland. I made a Tiger Woods type start on the 1st, taking 4 strokes including a lost ball to reach the gully at the bottom of the hill half way to the green, and spent much of the afternoon ricocheting through avenues of trees. The middle group reported that they all played “boringly competently” (I wish). Prizes went to Keir for nearest the pin, and and to Ian for longest drive – gratifyingly Ian had said before teeing off that he thought these prizes were a waste of time. Dear All, I either seem to have forgotten to do my report or senility has set in. I can actually remember exactly what I was going to say, but do not seem to have written it down, and now I have no idea whether it was done or not! Sound a bit Alice in Wonderland? I thought so. Anyway it was simple really, we all enjoyed playing Ashley Wood but really there was only one person who properly turned up – Nick Maynard, who simply played out of his white rabbit skin, but unlike Alice definitely ended up with Jam today, not yesterday or tomorrow. 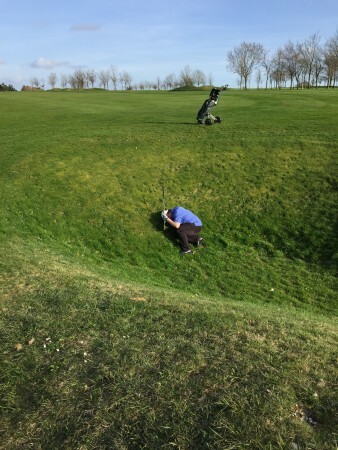 Scoring a humongous 42 points – the best ever by a BWCC player – he also won nearest the pin on the 18th, a difficult hole on any day, and effectively completed a sensational round. The only other two things of merit were the inclusion of two new players Trevor and Marcus who will hopefully join us again, and of course the Ashley Wood Drag Queen of Hearts telling poor Ben firstly to take his shoes off in the Club house, which he duly did, but then to tuck his shirt in before venturing out to play golf. I can not wait for Ian Poulter to turn up for a pro-am some day. I am very glad Ben escaped with his head! What a great start at West Wilts. Teeing off at the top of the hill above Warminster in bright sunny warm conditions, with 360 degree views, and not much wind, was West Wilts at its finest. What a great way to start the season. Julian had brought a friend – you see he has more than one – Keir C who seemed to fit in with the Buckhorn Ethos effortlessly, and we will hope to see him again especially as he respectfully came third, on the same points as Julian but beating him on count back. The ever improving John Mac was second, with Richard of the Stapleton (is this a character from Robin Hood?) firing straight and true as an English Longbowman to claim first prize, but sadly not winning a fair maiden as far as I know, well to be honest he did that some time ago. On a war and weapons theme, my favourite moment was when on hearing a shout of fore from in front of us , Innes with remarkable reflexes and the instinct of a 1915 veteran, threw himself into a grassy shell crater until the danger had passed. For those of you who know the layout of this course you will instantly know how I was taken back in time, for others please see the photo! Dave and Ian were the only two to hit either ‘nearest the pin greens’ with Dave winning the cigar.